My Sister Bakes is a humble looking shop located at Block 81 of Macpherson residential estate. It started as an online home bakey before getting a shop as its bakery. I have wanted to pop by to try their cake ever since I spotted them on instagram, when their shop was under renovation. But never find the time and chance till the Saturday. The speciality at My Sister Bakes is the Butter Cakes, with a main focus on customising cakes for all occassions and even the gorgeous dessert tables too. And they conduct cake decoration workshops too. 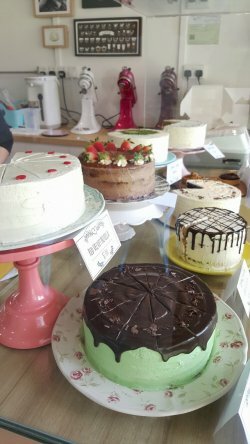 All cakes come in sizes 6″, 8″, 9″ and 12″. The name My Sister Bakes was chosen as Esther, the baker, started her baking back in Melbourne and from then her love for baking developed and she is non-stoppable. She explore new recipes and her siblings were her guniea pigs for the taste test. On the day of my visit, a Saturday in February, 7 cakes and 3 tarts were available. The 7 cakes were After eight, Choc chips, Classic chocolate, Earl Grey, Matcha, Milo Dino and Red velvet nutella; while the 3 tarts were Chocolate banana tart, Chocolate cookie butter tart and Yogurberry choco tart. I decided to get a sliced of cake and a tart to try them out and see how they fare. I went for the Earl Grey Cake. What I like about this cake is the dense but yet soft cake with thin layer of butter cream, not too cloying sweet. It has a good enough Earl Grey scent. Personally, I find it just nice though I wouldn’t mind it stronger. Among the 3 tarts available, I though Yogurberry Choco Tart sounded unique. The tart has chocolate and strawberry in the biscuit tart and topped with yogurt like cream and biscuit crumbs, drizzled with chocolate sauce. I like the combination. My Sister Bakes cakes are not only a feast to the eyes but certainly to the tastebuds too. A pity one could only get their hands on the slices over the weekends. But I suppose good things are worth waiting for.